I avoided subscribing to an anonymous VPN service for a long time, but I changed my mind about five years ago. I did some research, and narrowed my search down to a few candidates. I wasn’t even going to bother pulling the trigger—I just didn’t feel like I had much need to keep any of my Internet activities anonymous. Then I learned that Private Internet Access would allow me to pay for their service anonymously using a Walmart or Starbucks gift card. It costs a few dollars more, but sneaking around James Bond-style sounded like it would be fun to write about! I bought a gift card, took some pictures and screenshots, and got myself set up with an account with Private Internet Access. Then I completely forgot to write about my adventure! I don’t believe paying with a gift card is an option any longer, but you can pay with various cryptocurrencies. The service works great. It usually has no trouble keeping up with my FiOS Internet connection at home, and Private Internet Access allows you to stay connected on up to ten devices at the same time—up from five devices when I signed up! I set it up on my desktop, laptop, and all my Android devices. I particularly like the Android client. It is just a wrapper around OpenVPN, but it has a nice “Internet Kill Switch” checkbox. 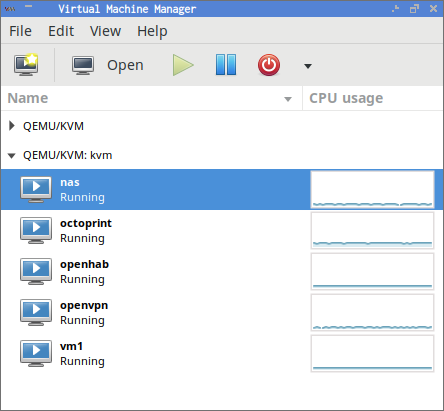 I also have a virtual machine on my KVM server that is always connected to the PIA VPN. If I feel the need to hide any traffic from my ISP, I just set that host as my default gateway, and it will route the traffic through the VPN for me. A while back, I was contacted by a shady-sounding VPN provider. They wanted me to advertise their service on my blog and use their affiliate program. I’m always cautious when companies contact me like this, and I don’t like to endorse products or services that I don’t actually use. All providers of this sort of VPN service are going to be slimy or shady in one way or another. You don’t want them to log your traffic or connections. You don’t even want them to know who you are, or tell anyone that you’re a customer. You’re quite possibly a little shady, too. Maybe you just want to make sure the folks on the coffee shop’s WiFi aren’t snooping on your traffic, but you also might be using the service to watch something on Netflix that isn’t available in your country. I’ve been a happy customer of Private Internet Access for a long time. Their prices are reasonable. Their policies seem reasonable. They also happen to have an affiliate program, so I signed up. If you click any of my links to PIA in this post, I will get a small slice of your payment. When you’re away from home and connected to someone else’s network, you’re much more vulnerable to attack. Other users just like you might be trying to attack you, and the owner of the network could easily be snooping on your traffic. My long time solution to this problem has been to push all my traffic over an ssh tunnel to one of my own Virtual Private Servers. This is a simple solution for someone like me. It keeps me safe from people on the local network, and it lets me bypass plenty of corporate firewall restrictions. I trust the operators of my data center just as much or more than I trust my ISP. There are some downsides to using the ssh tunnel. It keeps folks on the local network from snooping on my traffic, but the servers I’m connecting to will see the IP address of my Virtual Private Server. There are also the problems that can occur when tunneling TCP over TCP on a congested link. That IP address is most definitely tied directly to me. My data center knows exactly who I am. They know where I live. They have all my billing data. If you’re trying to keep anonymous, then this will be a problem for you. An ssh tunnel to a VPS is also not something my mother could use. Using a VPN like Private Internet Access will protect you in the same way as my ssh tunnels, but it will also provide an additional layer of anonymity. If you use a payment method that isn’t tied to your identity, it will be extremely difficult to match the IP address that shows up in server logs to your actual identity. Among other options, Private Internet Access uses OpenVPN, but they also provide a friendly client application to get you connected, so it is definitely something my mother could manage to use. This is easily worth $3.49 per month. Why not use a free VPN service? They say that if you’re not the customer then you must be the product. This is what makes me shy away from free VPN providers. If you’re worried about a hotel or coffee shop snooping on your traffic, then why wouldn’t you be worried about your VPN provider doing the same thing? Selling information about your activities would certainly be one way for a free VPN service to make money. I’m happy to pay $3.49 a month in an attempt to mitigate some of that risk. If you’re asking this question, there’s a good chance you’re more paranoid than I am. If you’re trying to hide from the government, or you’re doing something illegal, then you need to hide behind more than an anonymous VPN service. I am far from an expert at hiding from the government, but if you’re just trying to protect yourself when using the free Wi-Fi at the airport, then an anonymous VPN like Private Internet Access is exactly what you need. Why did I choose Private Internet Access in the first place? It has been quite enough years since I made the decision to use Private Internet Access, so my memory is a little hazy. The ability to use the Private Internet Access service on ten devices simultaneously was a good fit for me. That had me covered on my desktop, laptop, phone, and Android tablet. In addition to those four devices, I’m also connecting to PIA with one of my virtual servers here at home. The “Internet Kill Switch” feature in their Android client is particularly useful. This may not be the case any longer, but when I signed up for PIA, none of the Android OpenVPN client GUIs were equipped with a similar feature—Private Internet Access uses OpenVPN. When the “Internet Kill Switch” is active, your phone or tablet won’t accidentally attempt to leak data over your unsafe connection if the VPN disconnects. This is exactly the sort of safety net you need when connected to a sketchy Wi-Fi access point! I know enough about OpenVPN to accomplish the same thing by hand—I’m already doing this on one of my machines. You shouldn’t have to know how to do this, though. It should be easy to configure, and PIA makes it super simple to enable. The Android app also allows you to bypass the VPN on a per-app basis. I use T-Mobile, and they don’t bill me for data when streaming video or music from most popular services. With the PIA app, I can bypass the VPN for YouTube, Google Music, and Netflix, and just leave the VPN active all the time and not worry about accidentally wasting my valuable data when I’m out and about watching YouTube videos. I’ve been using Private Internet Access as my VPN provider for years. They’ve done a fantastic job. They recently raised their prices, but I’m not entirely sure by how much. I’m not intimately aware of their pricing structure, but it looks like their 2-year prepaid plan has gone up by $0.15 per month. At the same time, they increased the number of concurrent VPN connections from 5 to 10. That’s a great deal. PIA seems like a reasonable company. They contribute to open-source projects. They score well on That One Guy’s VPN privacy chart. Their prices are pretty good, and you’re definitely not the product. The Android app is quite good. What do you think? Am I an idiot for recommending and using PIA? Do you have a better suggestion? Tell me what you think in the comments! 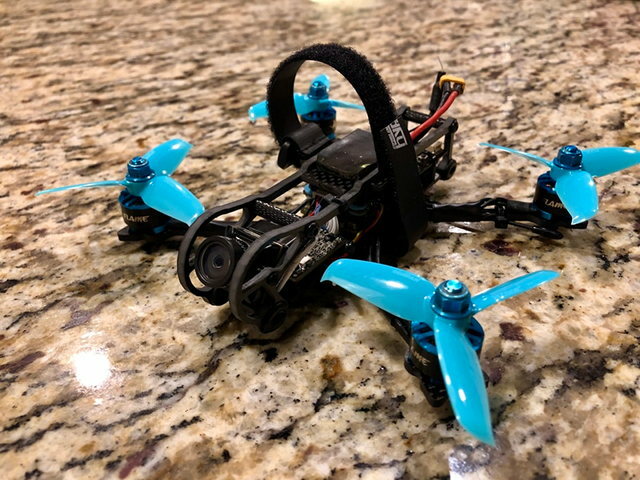 I’ve had my EMAX TinyHawk for quite a few months now, and I just realized that I haven’t actually sat down to write about it yet! I’m excited about brushless Whoops, and there are a lot to choose from now like the Mobula 7, the Eachine Trashcan, or the EMAX TinyHawk. What is a Tiny Whoop? Why would you want a brushless Whoop? Why did I choose the TinyHawk? The real Tiny Whoop is a ducted, brushed micro FPV drone, and it excels at indoor flying. There are other brushed Whoop clones, like the NewBeeDrone AcroBee, or cheaper, less capable clones like my Eachine QX65. There are two things I dislike about these brushed Whoops. Brushed motors have a limited lifespan. They may only last about four hours or so. These quads are also rather fragile. They don’t get into too much trouble, because they weigh less than 25 grams, but I’ve broken a few Whoop frames. Brushless motors won’t wear out. You might step on one and break it, but you’re not going to smash one of these in a crash like we can with our heavy 5” quads. This makes the brushless Whoops more durable, and reduces the time you have to spend maintaining them. So why did I choose the TinyHawk? The Mobula 7 and Trashcan can run on 2S batteries, so they can generate a lot more thrust than the 1S power of the TinyHawk. Doesn’t that make the TinyHawk a terrible choice? I’m not a professional Whoop-class racing pilot. I’m not even an amateur. I just want a fun toy to fly indoors, and I want it to always be ready to fly. 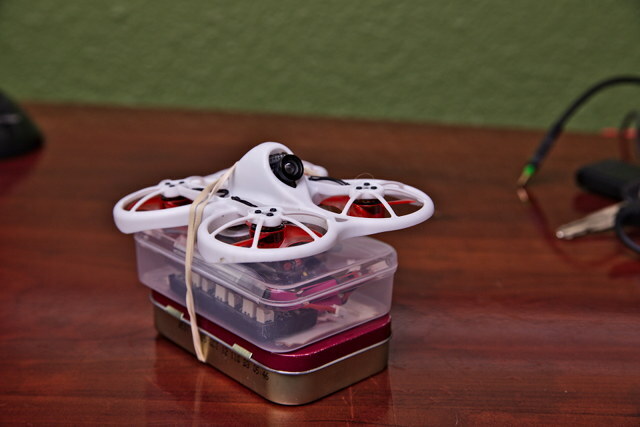 The TinyHawk is overbuilt, and probably a bit overweight. Its shell is sturdy. The props are thick and tough. As long as nobody steps on it, and no dogs decide to grab it out of the air, I expect my TinyHawk frame to last. I wouldn’t be surprised if I have put more than 100 batteries through my TinyHawk, and it looks just like it did when I opened the box. At the time that I bought my TinyHawk, people were regularly breaking their Mobula 7 frames. I hear that HappyModel has improved the Mobula 7’s frame since then, but I still feel that the TinyHawk has a leg up here. FPV looks like fun! Should I start with a TinyHawk? I believe the EMAX TinyHawk bundle is the best way to get started FPV, especially if you’re on a budget. The TinyHawk bundle plus a six-pack of additional batteries will cost you less than $200. You’ll have an indoor FPV drone, a controller, an FPV headset, and enough batteries to fly for nearly 30 minutes. I think the bundle is a steal, and it is possible to set it up to use the bundled controller to practice in a simulator. Everyone flying a 5” FPV freestyle or racing quad needs to learn to fly in the simulator. If you do move on to bigger and better FPV quads, you won’t be able to use the bundled controller. You will be able to use the headset for a while. If you have a TinyHawk or any other brushless Whoop, you need to check out Project Mockingbird. They have documentation for tweaking Betaflight to make your brushless Whoop fly better—much better! I tried their Betaflight brushed Whoop settings on my Eachine QX65 last year, and the difference was like night and day. It made the QX65 more responsive, and it had a lot less trouble with propwash when descending from the second floor of the house. When my TinyHawk finally arrived, I didn’t even give it a test flight before applying Project Mockingbird’s brushless Whoop settings. If you have any complaints about how your TinyHawk handles, go check out Project Mockingbird. Can I fly the TinyHawk outside? You can, but only in the same way that you can drive a go-cart on a Nascar track. The TinyHawk is extremely fast in the enclosed space of your house, but a small park will feel huge, and it will take forever to fly from one side of the park to the other. Wind will also be a problem. A light breeze will just make it difficult to aim your TinyHawk through gaps. On a properly windy day, your TinyHawk may not be able to fly faster than the wind, and it might get carried away! If this is your first experience with FPV, you’ll have some fun outside with your TinyHawk. Just be careful not to lose it! The 6-port USB charger than comes with the TinyHawk works, but it is extremely slow. I’m using the charger than came with my Eachine QX65. Similar 1S chargers are available on Amazon. At 600 ma per port, it is probably twice as fast as the TinyHawk’s USB charger, but it requires a DC input—I use my big 6S field charging LiPo. My friend Brian uses the CX610 charger. It has 6 ports, and each port charges at 1 amp. That’s nearly a 2C charge rate for our 450 mAh TinyHawk batteries, and it charges nearly twice as fast as my charger, but it also requires a DC power supply or a big LiPo battery as an input. These were hard to find when Brian ordered his—I think he ordered the last one available at Amazon that day! They seem to be more common now. With the CX610 and six or eight batteries, you can probably manage to fly continuously for more than an hour. Don’t buy my charger. Get the CX610. It is about the same price, and a much nicer piece of hardware! I have two or three 5” freestyle quads. They’re big, heavy for their size, and they capture awesome video footage. You’d never fly one of these indoors, and they’re not appropriate in every situation outdoors. Sometimes the space is too confined. Sometimes it’d be too risky to fly something so heavy and capable of causing so much damage to people and property. I also carry a 3” freestyle quad. It is built with a tiny HD video camera on a vibration-absorbing Kestrel frame, and it weighs just over 220 grams. The entire build costs less than [the GoPro][gp] I send up on my 5” quads. It would be difficult to break a window with this little guy, but it would still cut someone up pretty badly if it hits them. It would also be much less upsetting if I lost this quad in a lake or river. Then I have my TinyHawk. I’m not going to capture any amazing video footage with this thing, but it is extremely safe. I’ve flown it right into my face, and it didn’t do any damage. We fly them in the house around our pets and children all the time. 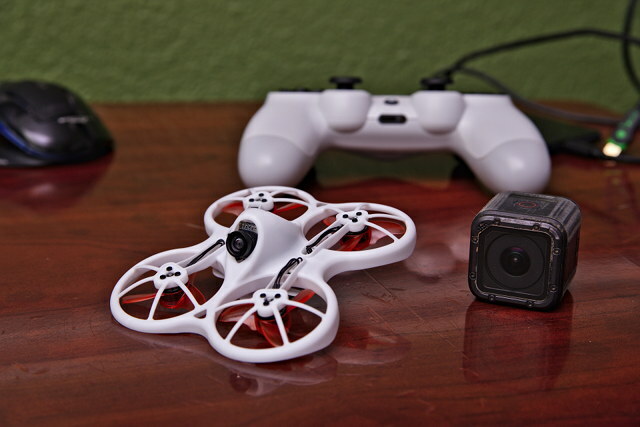 If you think flying FPV looks like fun, you should pick up a TinyHawk bundle. If you’re already flying a larger quad, and you have an FrSky radio and a set of goggles, but you don’t have a brushless Whoop yet, I think you should buy a Tinyhawk. 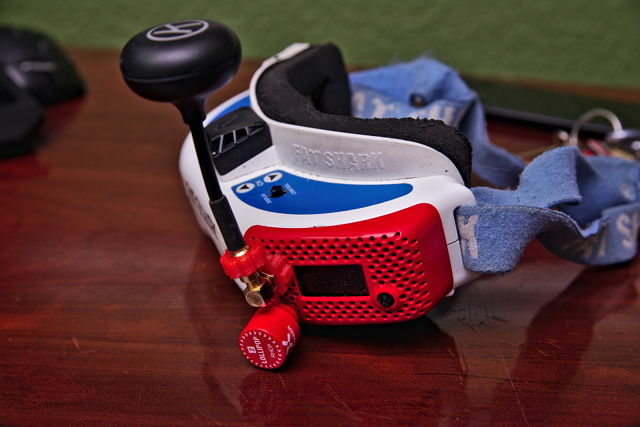 The TinyHawk strikes a good balance between performance, enjoyment, durability, and cost. Many of the reasons for choosing your 1S or 2S brushless Whoop will be subjective. I’m glad I chose the TinyHawk, and I’d make the same choice today. Unless you have some specific goals in mind, I don’t think you can make a bad choice in a brushless Whoop. They’re all inexpensive. They’re all durable. They’re all fun. What do you think? Do you prefer the Mobula 7 or the Eachine Trashcan? Do you prefer old-school brushed Tiny Whoops? Tell me what you think in the comments, or stop by our Discord server to chat about it! My open-source Kestrel frame is easily configurable. For my first build, I filled the frame with components that I already had on hand—the guts from a Leader 3 bind-n-fly quad. I knew that I wanted to try to fit a 4” HD quad in under the 250-gram limit, but I wanted to work out as many design bugs as I could first. The design work on the Kestrel is pretty much complete. I found a few bugs when assembling my 4” build that didn’t show up on the 3”, but they were all easy to correct, and the changes didn’t introduce any incompatibilities with my official 1.0 release. I’m so glad I don’t have to increment to version 2.0 already! I don’t have any sort of legal requirement to stay under 250 grams, so I’m just using that figure as a guideline. I can get away with using components that aren’t quite suited to the lightest build possible. The FC, ESC, and VTX modules are overweight, but they really aren’t all that heavy. Using lighter, less-capable electronics might have saved me 10 to 15 grams. That’s not a lot of weight, but my build comes in at 270 grams with a 650 mAh 4S battery. My build does manage to come in at 244 grams with a 450 mAh 4S battery, but that battery is on the small side. I’m right on the edge here. If I could save 10 grams on my components, and then save another 10 grams by using a 550 or 600 mAh battery, that would be awesome! I’m writing this section of the blog before having a chance to actually fly my 4” Kestrel build. It is fully assembled and configured, and it survived a test hover in the front yard last night. It has been raining all day, so I won’t be testing it for a few days. I want to be honest. I want to tell you what I’m hoping to get out of this build before I can actually verify my hopes and hypotheses! I used to fly 6” and 5.5” props on my freestyle miniquads. I didn’t fly 6” for long, but I flew 5.5” props for the better part of a year. On the same quad with the same motors, 5” props are more responsive and have a higher top speed compared to 6” props. 6” props have more bottom end that you’ll really notice when pulling out of a dive, and they are significantly more efficient. 5.5” props land somewhere in the middle, but I used to get about 20% more flight time compared to 5” props. Will this relationship between 3” and 4” be similar to the relationship between 5” and 6”? That’s my hope! I’m a little concerned, though. I once tried 6” props on my BFight 210 with it’s 2204 motors. I didn’t lose any flight time, but I didn’t gain any, either. The 6” props were just too heavy for those motors. Will the 1606 motors be beefy enough for 4” props? This was part of the last flight of my 3" Kestrel. At some point, I knocked the the USB connector off, and it shorted something on the flight controller. It'll be cheap to fix, but I have to wait for a part to arrive! I’m expecting significantly longer flights out of the 4” props, assuming the motors I chose don’t wind up being ridiculously underpowered. I owned a 4” FPV miniquad a long time ago. It was big, heavy, and used 2204 motors and 1,300 mAh 4S batteries. I expect the 4” setup to be smoother than a 3”, and I’m hoping it doesn’t feel too sluggish when doing snappy freestyle. I feel like my 220-gram 3” Kestrel might be a bit too snappy, so I’m thinking I might enjoy the 4” build! What if it is terrible at freestyle?! I decided to use a big, heavy 1,000 mW VTX in my build. Assuming that I’m correct about this being more efficient, I would enjoy the idea of having a sub-250 gram medium-to-long-range HD quad! I don’t trust static thrust tests—especially from manufacturers! A quick look at the numbers tells me that the 4” props on the 1606 motors should be able to cruise along at 30 to 40 MPH while consuming about 40% less power. They’re also capable of producing nearly double the amount of thrust with 4” props, but at the cost of about 30% higher amps. How is that going to work out in the real world? If things work out in my favor, I will be able to cruise longer and meet or exceed my 3” Kestrel’s flight times when doing aggressive freestyle. 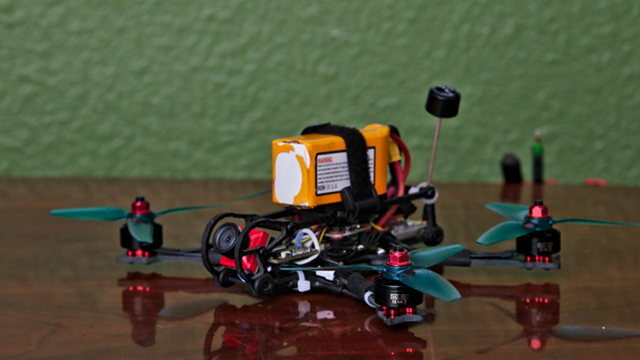 My old 4” Holybro Shuriken 180 Pro was a scaled-down 5” racing quad. 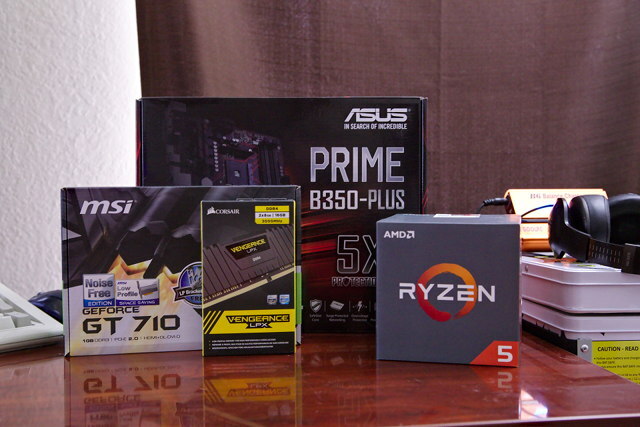 My new build is attacking this problem from the opposite direction. I’m scaling up a 3” micro, so instead of using 2204 2750 kv motors, I’m using EMAX 1606 3300 kv motors. This is why I’m referring to my build as a light 4” quad. The Aikon stack is total overkill for this build. That little 20x20 stack can easily power a 5” 6S racing quad. It would have absolutely no trouble driving my 680-gram 5” freestyle quads. I’m certain that there is a cheaper, smaller, lighter FC and ESC combo that could drive these motors and props. This is going to be my test platform, though. I have a plethora of interesting motors and props lying around. I have some efficient 2205 motors that I’d like to try with 5” props. I have all sorts of 2306 and 2207 motors, too. Maybe I’ll try a ridiculous 6” Kestrel. It is easy to cut arms and stick them on this fuselage! 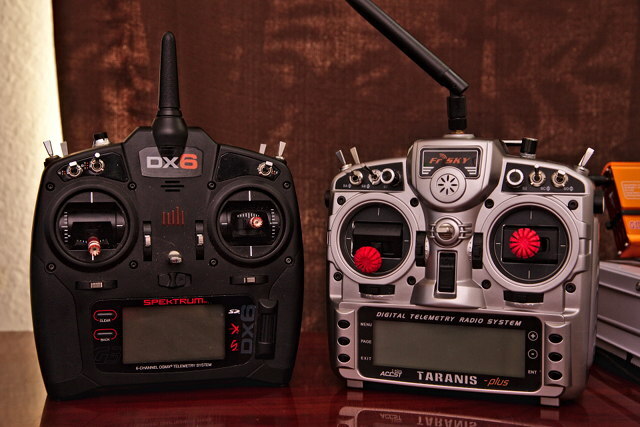 The VTX and antenna are on the heavy side, too. The VTX is only 6.5 grams, and the AXII only adds another 2 or 3 grams. The little 200 mW VTX and tiny whip antenna from my Leader 3 weighs less than 4 grams. These heavy components are buying me versatility for testing and some extra VTX juice for long range. I guess my light 4” build is a bit on the tubby side! Minor problems with my Kestrel design! I was worried that the Aikon AK32PIN would be too long to comfortably fit on my Kestrel’s bottom plate. I didn’t want to alter the spacing between the mounting points of the side plates, but I could see that there was some wiggle room to push the front and rear stacks closer to the edges. I was only able to move each stack forward or backward by 3 mm, and that made the build a lot more comfortable. Unfortunately, this also pushed my Caddx Turtle’s 20x20 board too close to the camera! I raised the top plate a bit to make more room for the stack. The combination of the bottom plate, side plates, and the bushings that hold everything together is rigid enough, but it will flex quite a bit in a crash. This will make it harder to damage your flight controller in a crash, and give you a bit more room to build. The center stack uses M3 holes as of version 1.0. I have grommets to bring those holes down to size for M2 stacks while providing a bit of vibration isolation for your flight controller. The grommets work great, and the M2 screws are no problem. I didn’t remember to leave clearance for the head of an M3 screw! There’s a cutout in each arm that leaves enough room, but the arm bracing plate won’t let an M3 screw head pass. This was an easy problem to correct, and I was able to work around the issue when assembling my 4” Kestrel with an M3 center stack. How does the 4” Kestrel fly? Other than a few mistakes that I’ve made, the 4” Kestrel is flying great! A lot of what I suspected is true. Even though it is only 20 or 30 grams heavier than most 3” builds, it feels bigger. It reminds me more of flying a 5.5” or 6” quad. It still gets up to top speed quickly, and it catches itself from a fall with barely any throttle. What kind of mistakes did I make? My side plates are rather floppy, and I’m only certain about what caused one of the problems that has these things flopping around! We had an audience and horrible weather and lighting for the maiden flight of my 4" Kestrel. It feels great, but the HQ 4x4.3x3 props are too heavy. I'm ordering HQ 4x3x3 props. When I moved the front and rear stacks outward, that created an opportunity to carve some material out of the bottom plate. This was a mistake, because my bottom plate is now quite flexible! Also, a pair of my bushings are fitting loosely, but only on the left side! These aren’t fresh bushings, but they don’t have a lot of mileage on them, either. I’ve adjusted the bushing holes and the tabs with every prototype. I think I’ve just pushed things too far. I’ve added 0.5 mm back into the tabs in the model. We’ll see if that fits better. My side plates are floppy enough that the camera shakes around. It looks terrible! I also made a mistake regarding the propellers. I had a few pairs of HQ 4x4.3x3 v1s props in my drawer. I shopped around a bit, and that was the gentlest prop I found, so I ordered a few more. GetFPV is one of the few stores that stocks HQ 4x3x3 v1s props. I haven’t flown them yet, but I’m excited to try them. They should be arriving before the end of the week. I don’t think 4” props are ridiculous for a 1606 motor, but I’ve been worried that the HQ 4x4.3x3 would be too aggressive for such a small motor. It flies well, but it isn’t as efficient as my 3” 1306 Kestrel with HQ 3x3x3 props. The 4.3 pitch props cruise at around 35 MPH with 22% throttle. That’s at least 10% less throttle than my 3” Kestrel. I spent an entire 650 mAh pack flying around like that, and couldn’t fly any longer than 6 minutes. My 3” Kestrel usually hits 5 minutes doing pretty aggressive, heavy-throttle freestyle. I’ve never tried for endurance on the 3”, but I know I’ve accidentally flown longer than 6 minutes on it before! So far, I like the 4” Kestrel, and it is showing some promise. If all the HQ 4x3x3 props wind up doing is bringing the efficiency in line with my 3” build, I’ll be extremely pleased. I think I’m going to enjoy the 4” build more than my 3”, even if it doesn’t offer me longer flights. It just suits my flying style a bit more! I believe there’s a good chance I’ll see significantly longer flight times out of the gentler pitch 4” props. It would be nice to be able to put that heavy 1000 mW VTX to good use. I’ll know in just a few days, but I’m not patient enough to wait until then to publish this blog! Do you think I’ll get an extra minute or two out of the HQ 4x3x3 props? Do you think a similar build could be squeezed in under 250 grams with a big battery if I used a lighter FC, ESC, and VTX? Or do you think I should stick to 3”? Do you have any questions? Let me know in the comments, or stop by our Discord server to have a chat! Of course you can. There is absolutely nothing stopping you. My home NAS is running in a virtual machine. Should you host your NAS as a virtual machine? I don’t know anything about your needs, but I bet you can get away with running a NAS in a VM. It is definitely the correct option for my use case! Some folks will tell you that running your NAS in virtual machine a terrible idea. I’m going to tell you why they’re wrong, and I’m going to help keep you from making mistakes that would make those people correct! What a is a NAS? The acronym stands for Network-Attached Storage. In the old days, We used to call them file servers, but I guess that just wasn’t fancy enough. Anything that shares files on an IP network qualifies as a NAS. In the old days, we even used IPX, but we didn’t use the term “NAS” back then. Your cheap Wi-Fi router with a USB flash drive plugged into the back. Your old Windows XP laptop that’s sharing all your movies. My own virtual server running Samba on Linux. My friend Brian’s beefy DIY NAS servers and his EconoNAS boxes. They’re all network-attached storage devices! A NAS doesn’t transcode video. A NAS doesn’t have to be using ZFS. A NAS doesn’t require ECC RAM. A NAS doesn’t host virtual machines. A NAS isn’t an iSCSI target—that’s a SAN! Running extra services like a video transcoder, iSCSI targets, or virtual machines will make your server more versatile. They aren’t part of the NAS. But what if I want to run Plex on my NAS?! That’s fine! A NAS server is just a file server, and a file server is just a computer. You can do whatever you like with your computers. You want to host VMs on your server? Go for it! Just make sure you have enough RAM and CPU to handle the load of those virtual machines. A NAS doesn’t need much processor power or a ton of RAM—your Gigabit Ethernet or Infiniband connection will be your bottleneck most of the time. Transcoding video doesn’t require much RAM or disk, but it sure does need a lot of CPU. This is exactly the sort of use case where virtualization excels. Your NAS isn’t making much use of your processing power, and your Plex transcoder isn’t fully utilizing its disk or RAM. If you put them both on the same box, you’ll make better use of your hardware. Why virtualize each service? Why not put the NAS and Plex server on the same machine? Plex communicates with services on the Internet. That’s enough reason for me to want to keep my file server separate from Plex. I want Plex to be able to see my videos. I don’t want my bank statements or drafts of my upcoming blog posts leaking out to the Internet! Am I building a NAS that transcodes video, or a transcoding server that serves files? This is almost a silly question. You might use a truck to haul plywood home from Lowes. You might use a minivan to drive your family to the arcade. You can pack your family into the pickup truck, but you might only have those goofy little fold-down seats in the back. You can haul plywood in your minivan, but you’re going to have to fold down or remove the seats. Each can do the job of the other. Your preference will be based on which task you do more often. If you’re hauling six kids around every day, you want the minivan. If you’re running to Home Depot three times a week, you’ll want a truck. These are two options that can handle two very different jobs. Maybe you don’t have six kids, and you never bring plywood home from Lowes. You don’t need a large vehicle. Maybe you’re like me, and you only need a Miata. Sharing files to a handful of computers at home doesn’t require much CPU or RAM. It doesn’t require a truck or a minivan. You can build a little Atom or Celeron machine that sips power and doesn’t cost much. 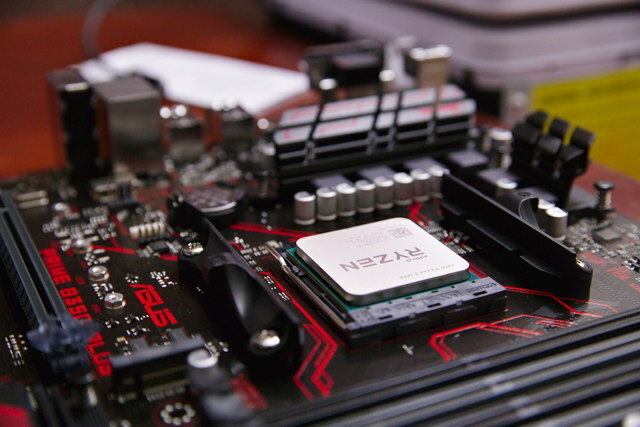 If you need to transcode video on demand, you’ll be looking at entirely different motherboards and processors. You’re going to be looking at trucks or minivans. Are you building a NAS that also transcodes video, or a beefy transcoding machine that happens to serve files? I don’t know which server is the truck or the minivan. I’m sure you get the idea. QUESTION: The streaming devices on every TV in my house can play back 4K content using all the common codecs just fine, and buying three or four of those is cheaper than the CPU it would take to transcode. What on Earth is everyone transcoding?! Everyone says I should run ZFS on my NAS! I agree with them. Running ZFS on a NAS is a fantastic idea. ZFS computes and stores checksums of all your data. When ZFS reads your data back from the disk, it compares the data to the checksum. If it doesn’t match, it knows your data is corrupt. If ZFS is able to read that same data from a different disk, it can correct that error. Standard RAID levels won’t even detect that kind of error, so they can’t correct for it. ZFS isn’t the only file system option with checksums, but it is one of the best and most advanced. The Linux kernel’s device mapper layer now has a module called dm-integrity, and I’m interested in trying it out. It adds a ZFS-like checksum layer to any block device. I have a feeling that I’ll have to tear down the RAID 10 on my KVM server to set it up, and I’m not excited about putting in that work! Earlier in this post, I said that all you need for a NAS is a USB flash drive. That may qualify as a NAS, but it would be a pretty terrible file server! Hard drives fail, and they fail often. Backblaze’s data says that 5% to 10% of their hard drives fail every year. RAID prevents downtime. If you don’t have hot swap bays in your server, you will have to take your server down to replace a dead hard drive, but at least you don’t have to go through the time and pain of a restore from backup. RAID won’t save you from a lightning strike. RAID won’t save you when a bad SATA controller mangles all your disks. RAID won’t save you when your file system gets corrupt. RAID won’t save you when you accidentally delete something. RAID won’t save you from malware. ZFS has some nice features that can mitigate some of these risks. Regular snapshots will probably protect your from malware and accidental file deletions, but not much else. It is fairly common to have a second drive in an array fail as you are replacing a disk. Rebuilding a RAID requires reading every bit of data from each drive, and it can take quite a few hours for the process to complete. This can be stressful for a drive that is already near the end of its life. Storage is cheap. Backups are expensive. Have you ever wondered why your IT department wants to limit your storage space and the size of your inbox? Adding a few more disks is cheap. Backing up all your data and sending it off-site every single day is expensive! Wait a minute! If ZFS is so great, why aren’t you using it on your NAS?! I set up my NAS virtual machine almost five years ago. My NAS is running Linux, and at that time, ZFS support on Linux wasn’t so great. Ubuntu had only just started shipping native, in-kernel ZFS support at that time. I’d already used the ZFS FUSE file system on another machine, but it didn’t perform all that well. I am not a fan of FreeBSD, and I have no need for the FreeNAS’s convoluted web interface—I work much faster at the command line. Plenty of people use FreeNAS, and I’m sure I could have run it in a VM. ZFS combines many of the features of Linux’s separate MD and LVM layers. This makes ZFS powerful and convenient, but ZFS is currently missing an important feature. You can’t add disks to an existing ZFS zpool. If you want to expand your storage, you have two choices. You can replace every single disk in your zpool, but this can be expensive. You can create an additional zpool, but if you’re using RAID-Z2, you’ll be wasting two more disks’ worth of space on redundancy. Linux’s MD and LVM layers allow me to easily add additional disks to my RAID 10 or RAID 6 arrays. When I run out of space, I just buy another drive. ZFS was created by a company that sells expensive, high-end servers. Every time it has been my job to spec out servers in a data center, I almost always filled the chassis with disks. That’s exactly what Sun expected their customers to do. If you’re spending your own money, there are plenty of good reasons wait until you actually need more storage before buying more drives. Prices decrease over time, and the older a drive gets, the more likely it is to suffer a mechanical failure. Which device should host my NAS? I like to consolidate my services as much as possible. Also, I’ve always encouraged people to run their in-home services on hardware that already needs to be powered on all day long. For a long time, I hosted my NAS and other virtual machines on my arcade cabinet. My NAS needs to be accessible 24 hours a day, and having my arcade cabinet ready to go at a moment’s notice was awesome. Why waste 30 to 60 watts on two different machines that are usually idle? You probably don’t have an arcade cabinet. I needed to get my NAS VM closer to my desktop, because CX4 cables for Infiniband aren’t very long! Does my NAS virtual machine need its own RAID? I had about four different headings here with about 1,500 words explaining the advantages and disadvantages of various RAID configurations. It was dry, boring, and probably not all that helpful. Instead, I’m just going to tell you what I do, and why I do it. On my own setup, my virtual machine host has a RAID 10 array with LVM configured on top of it. Some of my machines use LVM block devices on that RAID 10 array as disks, but most of them use disk image files that are stored on an ext4 volume on my RAID 10. I take a performance hit by using image files, but they tend to be more convenient than block devices. My virtual machines don’t need any RAID configuration. All the disk redundancy work is handled by the host. The less specific the virtual machines are to the host, the better. It makes it easier to shuffle machines around. If a drive fails, or I expand my storage, the virtual machines will be completely unaware. The RAID 10 array on my KVM server is encrypted. If someone pulls the plug and carries the box out of my house, they won’t be able to access any of my virtual machines. With this setup, I don’t have to enter a passphrase into each VM when they boot up. I only have to unlock one encrypted volume when the KVM server boots up. Is there any reason to set up your RAID in the NAS VM? Yes. If you’re running ZFS or dm-integrity on the host, and there is a checksum or read error, your NAS virtual machine will never know about it. ZFS may tell you that it corrected an error, or it may tell you that there is a file with a bad checksum, and it can’t fix it. Which file has the bad checksum? If you are running a set-up like mine, you’ll have to do a lot of work to find out. ZFS would tell me that there was a checksum error in the disk image file of my NAS VM. ZFS on the host doesn’t understand what’s inside that image file, and the NAS VM may have no idea that there was an error. If the error can be corrected, ZFS or dm-integrity will correct it. This will be the situation most of the time. If you’re starting to lose data to irrecoverable errors, you’re already in big trouble anyway, and it may be time to test your backups. How do I set up a RAID or redundant zpool in a virtual machine? Very carefully. Remember when I said there are reasons people will tell you it is a bad idea to run a NAS in a VM? If you set up your RAID inside the VM, and you make a mistake, you will greatly increase your chance of data loss! You have to make sure each virtual disk is pointed at a different physical disk in your server. You have to make sure that your virtualization software makes your virtual machine’s connection to the disk as direct as possible. It isn’t difficult, but you have to be meticulous. If you goof up, you can make things extremely fragile! ZFS needs to be as close to the disks as possible. You don’t want the host doing any caching. You don’t want the host absorbing any read or write errors. iXsystems has a post about how to run FreeNAS with ZFS in a virtual machine, and it explains the various pitfalls. I’m still going to say that you should follow my lead and set up your old-school RAID or ZFS on the host. Unless you have a really good reason to have the VM do this job, I doubt it will be worth the hassle for you. What does Pat store on his NAS? I store data that doesn’t comfortably fit on the SSD in [my desktop computer]. For the most part, that is the RAW files produced by my DSLR and FPV flight footage. A lot of people use their home NAS to back up the data on their computers. I prefer my backups to be off-site. I use Seafile to meet both my file syncing and backup needs. Seafile is an open-source Dropbox equivalent. It keeps all the data on my desktop and laptop in sync, and 90 days of file history are stored on the server. All the data on the server is encrypted on my end. If I need to restore a file, it will be on the Seafile server. If the SSD in my desktop fails, I have a recent copy of that data on my laptop, so I don’t have to wait for everything to download. I’m quite pleased with the functionality, redundancy, and cost of this setup. The only important data on my NAS that isn’t backed up is the GoPro footage of my FPV freestyle flying. The volume is huge, and the older it gets, the less value it has. The footage I collect each month is nearly as large as the collection of photos I’ve taken with my DSLR over a four-year period—200 to 250 GB. Storage on my NAS is rather inexpensive, so I don’t yet feel the need to delete any of the old footage. That said, I’m extremely unlikely to rummage through flight footage from two years ago. Most of the footage is mundane. Finding 20 seconds of interesting footage among 45 minutes of a day of flying is tedious. I could be served nearly as well if I just threw a large hard drive into my desktop computer. Everyone’s needs are different. Sharing files is the least important job handled by my little homelab server. Adding disks to my KVM box to supply storage space for my NAS VM was inexpensive, and it adds less than 10 watts to my overall power consumption. I don’t see a need to invest the money, electricity, or time into setting up and running a separate piece of hardware to store my large files. How are you handling your file-storage needs? 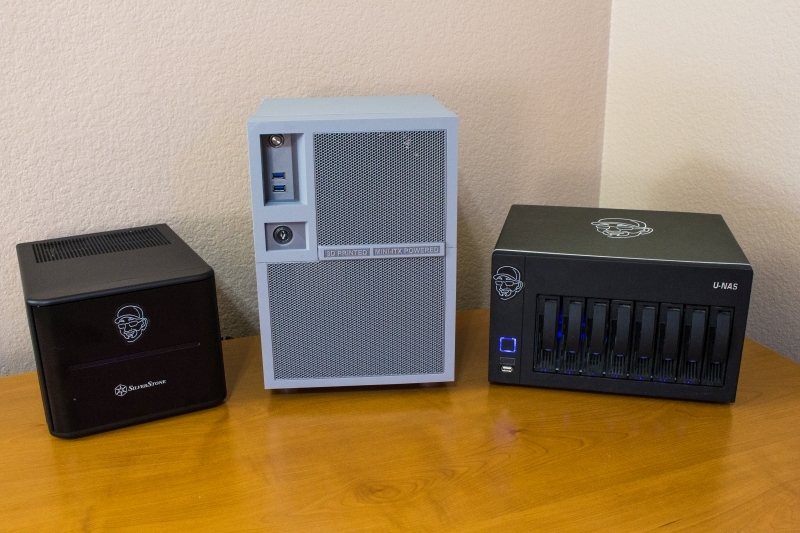 Do you have a dedicated, beefy NAS machine like the ones my friend Brian Moses builds? Did you win one of the NAS servers he’s been giving away over the years? How are you handling your backups? I’d like to hear about it in the comments, or you can stop by our Discord server to chat with me about it! I’m excited. I started working on my open-source HD micro frame roughly two months ago. Since then, I’ve assembled a Shapeoko XXL CNC machine, learned how to use the machine to cut carbon fiber, and I’ve flown several iterations of my frame design. I’m certain that there will be more changes to come, but I am quite pleased with the design so far, so I’ve decided to slap a Version 1.0 sticker on it! My current build is using EMAX 1306 4000 kv motors, and it weighs 223 grams with a 650 mAh 4S pack. I usually get around 5 minutes of fairly aggressive freestyle out of it. My friend Brian transplanted his Diatone GT-M3 to a Kestrel frame. 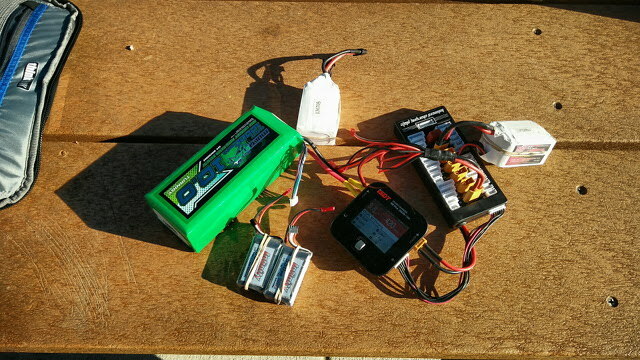 With his HGLRC 1407 motors, he’s coming in at 253 grams with the same battery. He’s a bit over the 250 gram limit, but not by much! I planned for the Kestrel to be open source from the beginning, but which license should I use? The choice of license was actually quite simple. I borrowed an awesome fillet function for OpenSCAD from Github, and that fillet function was licensed under the GNU GPL. Since I wanted to include that function in my source code, I had to license it under the GNU GPL 2 as well. 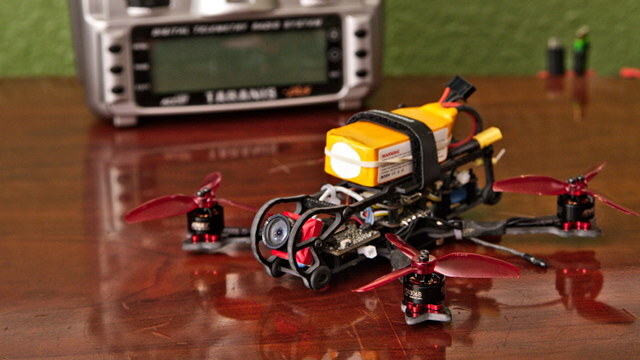 There aren’t a lot of open-source FPV quadcopter frames to choose from. The most popular would be the TBS Source One frame. How does releasing an open-source frame help you? If I stop manufacturing frames, you could still acquire spare parts from someone else—I haven’t even figured out how to manufacture or sell these frames! 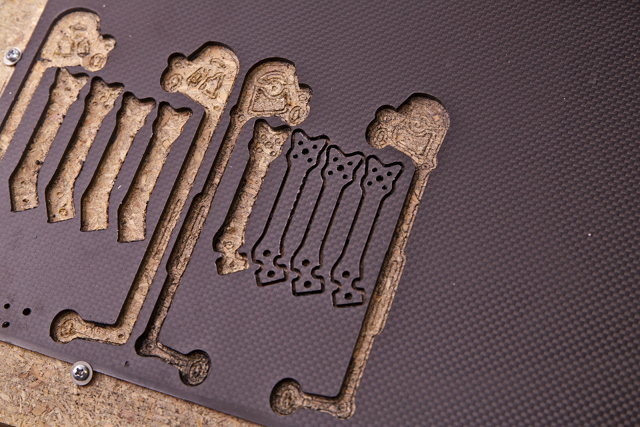 If you have access to a CNC machine, you can cut your own. I wish CNC machines were as readily available as 3D printers! If the source code is available, won’t that make it easier to clone the Kestrel? Yes, it will, but only slightly. Copying a frame is extremely easy. All you need is the piece of the frame and a scanner. Almost anyone could pull it off. I am much more excited about giving you the ability to cut your own frame than I am worried about someone selling copies of my design! 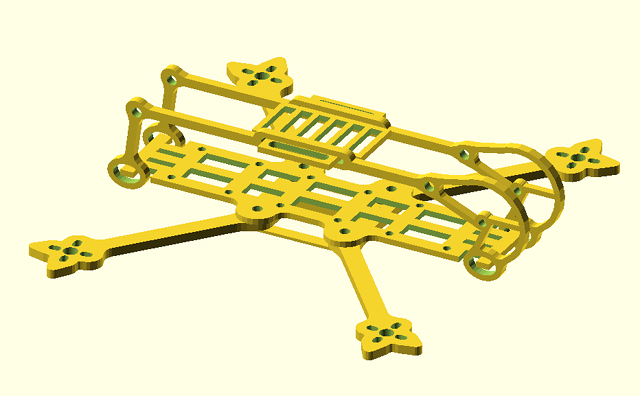 The Kestrel is designed using OpenSCAD. 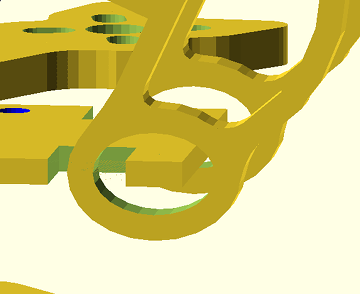 OpenSCAD is an open-source CAD package. Instead of creating your objects by dragging and dropping various shapes and operations around the screen with your mouse, everything is defined using OpenSCAD’s programming language. Everything is built from unions and differences of basic shapes like cubes, spheres, and cylinders. If you’re a programmer, this may be easier for you to handle than a traditional CAD package. OpenSCAD excels when you need to build objects that match precise measurements. You’ll start to get into the weeds when you try to model more organic shapes. Modeling in OpenSCAD requires more work up front, but it can pay off in the long run. The most time-consuming task when creating the Kestrel was getting the guitar-shaped motor mounts right. The mounts are built up using a configuration of hulls and fillets of a variety of discs. The diameter and spacing of those discs is based on the distance between the motor’s mounting holes. The entire mount had to work well with the 9 mm hole spacing of an 1106 motor up to the 16 mm hole spacing of a 2207 motor. Getting the ratios and angles correct to make either extreme look right was challenging! I think it was worth the extra work. There are quite a few important parameters of the frame that can now be adjusted by simply adjusting the measurements in variables at the top of the OpenSCAD source code. Do you want to build the tightest 2.5” HD micro quad? You can punch new measurements into two or three variables, and you can get the props as close to each other and the fuselage as you’d like. My 3” configuration pushes the motors out just about as far as they can go. If they were much longer, I would have had to extend my motor wires. Longer arms help deliver clean air to each propeller, and the extra leverage makes the quad more stable. 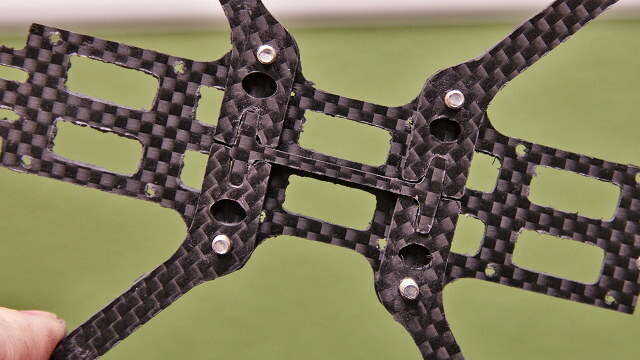 Do you want to fly a spindly, lightweight 6” HD quad? You could easily cut some crazy arms for the Kestrel, and I am more than a little tempted to try this! Are they bushings or grommets? McMaster-Carr calls them grommets, but I seem to keep changing my mind. This is the part of the frame that I need to get right. The Acrobrat comes with three different sets of bushings with various hardness ratings. McMaster stocks an appropriate bushing, and a 100 pack was less than $10. I didn’t get to choose the stiffness, though. They’re rated at a shore hardness of 55. That’s pretty close to the medium-stiffness bushing that ships with the Acrobrat. I can’t modify the stiffness, but I can adjust how tightly the grommet fits over the tabs on the bottom plate. My first prototype was too tight. I don’t even think the rubber was loose enough to absorb any vibration at all! I’ve loosened it up quite a bit. I made the tabs narrower, and I made the oval-shaped grommet hole in the side plate a bit taller. There’s a good bit of play in there now—hopefully not too much! I’m going to try a 4” build! The 3” version of the Kestrel is flying quite well. I’ve had some trouble with my 1306 build, but I think I’ve gotten it mostly under control—I hope! Brian’s 1407 build is flying great, even though he didn’t quite manage to fit under the 250-gram limit—not that he has any need to! I’d like to order some parts to build a lightweight 4” quad. I’m having a hard time choosing hardware. I like the EMAX 1606 3300 KV motors, but choosing a 20x20 stack is difficult! The motors aren’t much heavier than my 1306 motors, and longer, thicker arms will only add about five extra grams. I’m hopeful that my build will fit in under 250 grams, but I won’t be too upset if I exceed that weight. It has been two years since I flew a 4” quad. That old 4” quad had 2204 2750 KV motors. I’m hoping that the difference between a heavy 3” build and a light 4” build feels a lot like the difference between a 5” and 5” quad. It should have more bottom end, so it will be easier to catch the quad when falling out of a dive. It should also be more efficient, so I’m expecting to get longer flights. It will probably be less responsive, but the 3” almost feels twitchy to me, so that might be a bonus! If the 4” build flies well and fits in under 250 grams, I think it will be an interesting build for the parts of the world with serious weight restrictions! Motors are easy. Finding a 20x20 stack that I like is hard! Tiny boards for 2.5” and 3” micros are plentiful. 4-in-1 ESC boards that can properly handle larger motors and props are somewhat larger, even when they use the 20x20 mm mounting pattern. They also tend to require M3 screws instead of M2 screws. I can just drill larger holes in my central stack and call it a day, but I have a better plan. I’ve ordered some tiny grommets from McMaster-Carr. If I measured correctly, these grommets should work well for soft mounting a stack that requires M2 screws. The hole these grommets fit into should be just about the right size for an M3 screw, so these will allow for either configuration using the same mounting holes. I’m looking at two stacks. The Lumenier MICRO LUX V3 stack and the Aikon AK32PIN stack. These are both 20x20 stacks that require M3 screws. They’re both F4 flight controllers with blheli_32 ESCs. The Aikon ESC is quite a bit larger, but it is capable enough to be used in a 6S 5” miniquad. The Aikon ESC alone costs as much as the Lumenier stack. The Aikon ESC will be a tough fit, but it looks like I can squeeze it in. If I do go this route, and fitting such a large ESC is too difficult, I will probably adjust the length of the fuselage to compensate. Am I going to be moving past version 1.0 this quickly? The OpenSCAD source code, a simple build script, and SVG and DXF output files for several arm configurations are being hosted on Gitlab. There are configurations for two sets of 3” arms, one set of 4” arms, and a ridiculous set of 6” arms. Only one set of 3” arms has been flight tested. All the 3” and 4” arms are built by the build script, and the SVG and DXF files to cut those frames are in the output directory. I left the 6” arms out of the build script, because they’re just crazy. What makes the Kestrel unique? I wanted to build a 3” Acrobrat, but I don’t think the Acrobrat is the frame for me. I wanted to use 1106 motors, and I wanted to keep the weight down. The Acrobrat is a big, heavy frame. I believe it comes in at 54 grams with all the hardware. I hoped I could build something more appropriate for my own needs, and I think I’ve done a reasonable job! The Kestrel uses individual, replaceable arms. Those arms are easily configurable, so it should be possible to run anything from extremely short and tight 2.5” props on 1106 motors, 5” props on 2207 motors, or anything in between. Each arm is held in place with a single screw, so they are easy to replace in the field. The arms are positioned to keep the props completely out of view of the HD camera. I wanted to fit three 20x20 stacks, just like the Acrobrat. Having all that space makes it so much easier to build and repair your micro quad. In addition to room for three stacks, the M3 screws for the motors also line up with a standard 30.5x30.5 stack. The Kestrel uses a suspension system like the Acrobrat’s. The weight of the battery and HD camera are separated from the vibrations of the motors by rubber bushings. A Kestrel frame with long 3” arms currently weighs 39 grams. That’s about 15 grams lighter than the Acrobrat. I’m quite certain the Acrobrat is sturdier, but I’m hopeful that the Kestrel is just sturdy enough! Time and crashes will let us know for sure. How do we keep Pat working on open-source frames?! I’d love to tell you to buy a frame, but selling frames isn’t easy—especially if you’ve never done it before! I’m just barely beginning to investigate having 3” Kestrel frames manufactured. There’s no shortage of companies in China that will do this sort of thing for you, and it seems inexpensive—even for fairly small batches! I’m more than a little worried about attempting this, but if there’s enough interest, I’ll do what I can to have frames manufactured. I plan to at least offer a limited quantity of 3” Kestrel in my store on Tindie. If you’d like to buy a Kestrel, you can always get in touch with me, and I’m sure we can work something out. I don’t even know how much I should charge! If you think I’m doing interesting work, and you’d like to see me continue, you can always become a Patron. A few dollars a month goes a long way towards carbon fiber, replacing dull end mills, and helping me recoup the cost of the CNC machine. I’ve probably already gone through $50 to $100 worth of carbon fiber sheets on test parts. Every tweak to the frame eats $5 to $10 worth of material, and after two or three frames, I need to throw away a dull end mill. The costs add up fast! You can also help me out on Youtube. Subscriptions are awesome. Comments are even better. More eyeballs on the Kestrel will make it easier for me to work out manufacturing! I’m excited to be contributing an Open-Source FPV quadcopter frame to the community. I wish CNC machines were as prolific and available as 3D printers, but I’m still hoping someone will be interested enough to cut a frame for themselves! I’m starting to send frames out for testing. If you’re interested in testing the Kestrel, feel free to get in touch with me. I’m planning on sending some out for not much more than the cost of the carbon and shipping. Does it count as selling if I’m losing money? Are you flying an Acrobrat? Are you flying a different HD micro frame? Have you been hoping for a lighter Acrobrat-like frame with replaceable arms? I’d love to hear about what you’re flying! You can leave a comment below, or you can stop by our Discord server and chat about it! When the early reviews of the DJI Osmo Pocket started showing up on YouTube, I was disappointed in what I saw. The microphone sounded worse than what I get out of my $150 Android phone, and much of what should have been core functionality was relegated to add-on hardware. The Osmo Pocket costs $350, then DJI wants to nickel and dime you to add more physical controls ($59), Bluetooth and Wi-Fi ($59), a mic input (not available yet), and even a tripod adapter ($19). A nifty $350 video camera quickly becomes a $500 camera. At that price, you can start looking at cameras like the Panasonic Lumix G7. I’m well aware that these two cameras are like apples and oranges, but I can’t be the only one who could have their primary requirements fulfilled by either camera! DJI fixed the problem with the microphone, but I’m still displeased with the plethora of unnecessary add-on hardware. How much bigger would the Osmo Pocket need to be to squeeze in a threaded insert for a tripod, a mic input jack, and a Wi-Fi chip? I haven’t had the Osmo Pocket long enough to get much use out of it, so this isn’t going to be an in-depth review. I’ll be talking about the specs, how it compares to my Zhiyun Smooth 4 and the less-expensive Tzumi SteadyGo gimbals. So why on Earth did you buy an Osmo Pocket? I had a minor calamity, and it was an embarrassing one. I was out in the garage running my Shapeoko CNC machine. Its Dewalt router is quite noisy, and I was in the process of vacuuming up all the carbon fiber dust. I accidentally sucked something up into the vacuum, so I had to move myself over a few feet to shut off the vacuum and disconnect the hose. I stepped on something, and my foot started slipping. What did I step on? My cheap Android smartphone! It was screen down, and it was quite slick. The screen cracked. I don’t even remember bringing the phone to the garage with me! This is embarrassing, because I’ve been carrying a smartphone since the Palm Treo 650, and I’ve never broken a phone. I had a flash chip go bad once, but I’ve never physically damaged a phone like this. I was using that phone with a Zhiyun Smooth 4 gimbal. The Smooth 4 has been fantastic, and it is what I’ll be comparing the DJI Osmo Pocket to. The phone’s camera was just barely good enough, but it did the job. I stepped on a phone, so what do I do? Replace it with a phone with a better camera and continue using the Smooth 4? Or should I pop my SIM card back in my previous phone and try out the Osmo Pocket? The Osmo Pocket does many of the things that my Smooth 4 can do. They both offer face and object tracking, they can both record motion timelapse video, and they both have similar stability modes. The Smooth 4 has some interesting focus pulling features, but that feature didn’t work on my oddball phone. The Osmo Pocket has a better camera and microphone than my cheap Blu Vivo 8, and the form factor is a huge upgrade—the Osmo Pocket is a fraction of the size! The form factor of the Osmo Pocket is awesome! I’m good at sitting down at my desk and writing. I’m trying to do a better job of uploading content to YouTube, but I have been failing. My hope is that the convenience of the Osmo Pocket will encourage me to carry a video camera more often, and also to talk to the camera more often. You’d think I could manage to at least talk to my phone’s camera once in a while, right? It never works out, though. Holding the phone up to “vlog” isn’t comfortable or steady without a small tripod, and it is amazing how difficult it is to open the camera app, flip to the front camera, switch to video mode, and start recording when you only have one free hand. The Zhiyun Smooth 4 makes it easy to hold the phone up when you’re talking to the camera, but I never have it with me. It is way too large. The Osmo Pocket is tiny. In its carrying case, it fits safely and comfortably in the same front pocket as my phone. I am sometimes aware that it is there while sitting down, but it isn’t much of an annoyance. I can carry this thing for eight hours without any trouble. Recording myself or others with the Osmo Pocket is easy, too. It is light, so it is easy to hold it high enough that you don’t have to look up my nose while I’m talking to the camera. The camera’s field of view is reasonable for this mode of operation, and its face tracking does a good job of keeping me in frame. The Osmo isn’t just an upgrade for recording myself. It is a big upgrade over holding a smartphone when recording video in front of you as well. Holding the camera like a pistol is easier and more comfortable than holding a thin rectangle, and the stability of the gimbal makes your shots look more professional. 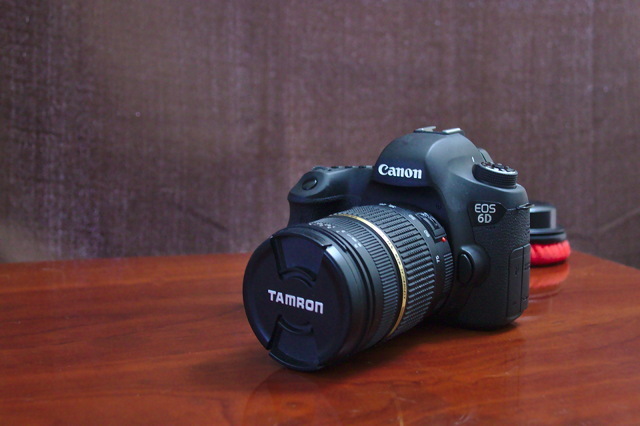 I love my Canon 6D DSLR. It is a fantastic camera for photography, and it is capable of capturing amazing video. It is getting old, and Canon has always been behind when it comes to video. The Canon 6D has no autofocus while recording video, and the thing weighs nearly three pounds with my favorite lens attached. If the subject is going to be standing still, and I have time to set up a tripod and a mic, my Canon 6D will easily out-perform the Osmo Pocket. I can’t carry my three-pound DSLR everywhere I go, but I can keep that Osmo Pocket on hand all the time. I can pull it out of my pocket and be recording video in less than five seconds. Whoever said this is absolutely correct. The best camera is the one you have with you. Especially when it is convenient enough to use! I’ve been 3D printing for a long time, so you can probably guess what the first thing I did after placing my order for an Osmo Pocket was—I stopped by Thingiverse to see if there were any things I needed to print! There’s no shortage of stands and tripod adapters for the Osmo Pocket on Thingiverse. I chose an Osmo Pocket stand that combines both into a single device, and it is working quite well. UPDATE: I’ve designed and uploaded a combination tripod adapter, stand, and case for the Osmo Pocket to Thingiverse! I’ve also designed my own adapter based on that same object. It isn’t elegant or clean, but it is getting the job done. Shortly after the Osmo Pocket arrived, I took it out to the car and tied it to my smartphone holder. I was impressed with how well it managed to record me while I was driving. I expected to hear a lot of road noise or the engine, but it sounded just fine! Using a Velcro strap to hold the Osmo Pocket in place every time I get in the car was going to be the opposite of quick and easy, so I decided to throw a quick design together. It isn’t anything fancy. Just a rectangle attached to the stand I had already found on Thingiverse. The Osmo goes in the stand, then the stand fits into the car mount just like a smartphone. I should mention one other accessory that I’m using, even though I didn’t 3D print it. I had to buy it. It is an extendable selfie stick tripod. It wasn’t too difficult to find, but the majority of these types of tripods have phone clamps on the end instead of ¼-20 threads. I bought this tripod mainly for recording video at my desk. All my small tripods are too short to get the Osmo Pocket up to eye level. This extending tripod folds up as small as my old mini tripod, but it can also extend all the way to 40”. You shouldn’t use it as a tripod at that length, because it will definitely tip over and smash your fragile Osmo Pocket. I extend it to 12” to 15” at my desk when recording my own ugly mug. You have to connect your phone to your Osmo Pocket at least once to activate the device, and again any time you need to update the firmware. I had to buy an adapter to plug the USB-C output into my old Blu Vivo XL2. The DJI MIMO app works fine with this adapter. I don’t have any plans to use their app when recording with the Osmo Pocket. I’m excited about having a tiny camera that I can fit in my pocket. I don’t want to make it bigger. I don’t want to waste time plugging devices together and opening apps. I just want to pull the camera out and start recording! The app was almost required before the recent firmware update. Today, you can access almost all the features and settings of the Osmo Pocket from its tiny touch screen. It can be a bit fiddly, but it works. For my use case and budget, I’m happy enough with my choice, but there are alternatives that will capture video every bit as smooth and steady as the DJI Osmo Pocket. The GoPro HERO7 Black has an option called Hypersmooth, and it is quite impressive. Footage recorded with Hypersmooth looks an awful lot like it was recorded with a gimbal, and the HERO7 Black doesn’t cost much more than the Osmo Pocket. If you’re interested in pointing the camera at yourself, the GoPro’s lack of a front-facing display will be problematic. The Samsung Galaxy S10+ has optical image stabilization on the rear camera, and it has a feature similar to GoPro’s Hypersmooth. I’ve seen some footage on the Internet, and it is quite impressive. I’m not sure if you can use that feature on the front-facing camera. The price of the Galaxy S10+ is several times that of the Osmo Pocket, but it is way more than a camera. There are a few features you’ll miss out on by using a phone or action camera instead of a gimbal, but I’m not sure how compelling those features are. You won’t be recording a motion timelapse or doing any face and object tracking without a gimbal. The Galaxy S10+ is the only phone with stabilization on par with the Osmo Pocket today, but that won’t be true for long. How many years will it be before $200 Android phones are competitive with Hypersmooth? The Blu Vivo 8 that I stepped on had a pretty reasonable anti-shake feature. Who knows where things will be in two more years? Last year, I bought a Zhiyun Smooth 4 gimbal for my phone. It works great, and it is a lot of fun to use. It has many of the same features as the Osmo Pocket, but it is available for about a third of the price. You probably already have a phone with a decent camera, so that’s all you would need to buy. A few months ago, my friend Brian bought each of us a Tzumi SteadyGo gimbal. Meh.com had a deal, and they were only about $30 each. They’re currently around $70 at Amazon—only a fifth of the price of the Osmo Pocket! The reviews are rather poor. They seem to fail a lot. I’ve only used mine a few times, but it seems to work about as well as the Smooth 4 gimbal. Basic gimbal functions work great, and face and object tracking seem to work fine. There are two big advantages that these gimbals have over the Osmo Pocket, and one huge problem. Smartphone gimbals cost a lot less, and you can upgrade the camera. Every time you buy a new smartphone, you’ll be getting a free camera upgrade. Unfortunately, both of these gimbals are huge. They’re about twice as tall as your smartphone and quite unwieldy. You won’t be putting either of these two gimbals in your pocket. You can pull the Osmo Pocket out of your pocket, take it out of its case, and have it recording in five to ten seconds. The only way to get up and recording that quickly with the Zhiyun or Tzumi gimbal would be by having the gimbal powered up in your hand the whole time. My Zhiyun and Tzumi gimbals are going to be spending a lot of time in the closet now, but I expect I’ll be pulling them out of the moth-balls in about two years! Those phone cameras just keep getting better. So far, I’m pleased with my purchase. It would have been nice if DJI made the Osmo Pocket just a little bigger. I would have liked to see the jog wheel, Wi-Fi, and Bluetooth included in the base device. Adding a tripod mount and mic input wouldn’t have required much more space, either. Even without these features, I think the DJI Osmo Pocket is worth $350. I’m infinitely more likely to be carrying the Osmo Pocket than either of my phone gimbals, and having quick access to the Osmo means I’m that much more likely to be filming. I need to be filming so much more often! Do you have a gimbal for your smartphone? Are you regularly using Hypersmooth or a Galaxy S10+? Have you tried the Osmo Pocket? Let me know what you think in the comments! I’ve been carrying a micro FPV quadcopter in my bag for quite a while. I started with a KingKong 90GT, then made a huge upgrade to a Full Speed Leader 120, until finally making the minor upgrade to a Leader 3. These micros were always an afterthought for me. Micros don’t fly as well as a 5” miniquad. They’ve been getting better quickly, though! The hardware has been improving, and so has the software. The gap between 3” and 5” FPV quads hasn’t completely closed, but it isn’t the chasm it was just a couple of years ago! I still like having one in my backpack, even if they don’t fly as well. They don’t weigh much, and they don’t take up much space. That performance gap is closing, and I bought a CNC router this year. Designing a spacious 3” micro quad with vibration damping seemed like it would be fun! That means it was time to try out one of these FPV cameras with a built-in HD recorder. This blog post isn’t going to tell you how to get the best footage out of your Runcam Split—I haven’t been flying long enough to figure that out yet! I am going to tell you why I think there are times when you might want to settle for the footage from a Split or Turtle. The Caddx Turtle V2 always makes me miss my GoPro HERO5 Session! I didn’t have a terribly compelling reason for choosing the Caddx Turtle over the Runcam Split Mini 2. The footage straight off the Turtle seemed marginally more tasteful to me, and I remembered not having a good time getting the original Runcam Split Mini into Brian’s 3” micro last year. As far as I can tell, there’s little difference in the video output of these cameras. Every time I get home and look at my footage, I wish the Caddx Turtle had GoPro’s Superview. Everything looks so goofy and fish-eyed through the lens of the Turtle. This looks worse the farther the horizon gets from level. Near the top of a power loop, the horizon will be curved to a ridiculous degree. The overall quality of the video isn’t the best, either. You can tell that the Turtle’s video files aren’t matching the bitrate of the GoPro, especially when you’re flying fast! I believe using an ND filter on the Turtle would address some of my complaints. I’m planning on trying this out sometime! Why the heck would I fly with a Caddx Turtle or Runcam Split if the GoPro is so much better? If I weren’t in the process of designing a 3” HD micro frame, I might have already given up on the Turtle. Getting smooth video out of the Turtle is a challenge, especially on a 3” quad. My 680-gram 5” freestyle quad is almost always smooth, and 15 MPH winds don’t push it around all that much. I feel there are at least two extremely compelling reasons to use a Caddx Turtle on a 3” micro quad: cost and safety. The components I used to build my 5” freestyle quad cost about $550. They don’t make my GoPro HERO5 Session anymore, but mine cost about $200. The full-size GoPro HERO6 Black costs $279. A battery costs about $25. That means I have $750 to $830 in the air every time I fly; even more with a GoPro HERO7 Black! My Leader 3 cost me about $120. The Caddx Turtle costs $65. It is tough to put a price on the Kestrel frame I cut for myself, but let’s just call it $35—that’s $10 less than an Acrobrat. Batteries for the little guy cost about $12. When I fly the Kestrel, I have less than $250 in the air. That’s $250 for everything in the air: the quadcopter, the battery, and the HD camera. That’s less than the cost of a GoPro HERO6 Black. The only way I know of to make that GoPro fly for free is by throwing it! If I want to capture some FPV footage in a spot where I might lose my quad, I know exactly which one I’m going to be flying! Are these really the only two options? Of course not! You can definitely build a capable freestyle miniquad for less than $550, and there are less expensive camera options. Foxeer and Runcam have made some reasonably priced action cameras. You can still get refurbished GoPro HERO4 Session cameras at Amazon for less than $100. I have one in my bag as a backup. It fits my existing GoPro mounts, and it has Superview, but I’m always disappointed in the footage I bring home when I have to use it. I’m sure I’ll be saying the same thing about my HERO5 Session when I finally have to upgrade! I could stick that $100 HERO4 Session and a $15 TPU mount on top of my $130 BFight 210 5” quad. I’m certain that that combination will fly smoother and record better freestyle video than the Caddx Turtle on a 3” micro, and the cost is about the same! My own 5” miniquad with a GoPro Session weighs 680 grams, and it is capable of traveling at speeds of more than 100 MPH. This has a tremendous impact on safety, and the extra weight means things are more likely to break in a crash. It is easy to destroy a $300 GoPro in a crash. I broke my first GoPro Session when I crashed into a tree. Trees are solid, but they’re not as solid as concrete! Just like everyone else, I have insurance on my GoPro cameras, so I had that one replaced. That takes time and effort, though. I don’t just break GoPros, though. I break arms, motors, FPV cameras, and batteries. The heavier your quad, the more likely you are to break something. You might break something on the quad, but you may even break something else. My 5” miniquad is going to do some serious damage if I hit a window, a car, or a person. A 680-gram object is going to do a lot more damage than a 250-gram object. This is where we drift back into talking about cost. The motors and batteries on my 5” quad cost about twice as much as the motors and batteries on my 3” Kestrel. This is partly my own choice. My 5” quad uses premium components, while my own Kestrel build is meant to be an inexpensive HD freestyle build! I’m usually nervous the first time I try something new or different. I remember the first time I flew over trees instead of in an open field, the first time I flew under trees, and the first time I flew over concrete or water. I was definitely a little shaky! Over the summer, I was riding my bike past a creek at the park. It is rather narrow, and the water is ten feet below the spot where I could stand. I decided I wanted to fly down there, so I loaded up my cheaper GoPro HERO4 Session, strapped my goggles on, and got into the air. It was tight down there, and I had to fly slowly. There was quite a bit of scraggle, and I did nearly clip a ghost branch on my way back. I was shaky and nervous the entire time! I was only saving $100 by swapping GoPros. If I wound up in the drink, I could have been out over $600. I wish I had my Kestrel that day. Risking a total of $230 would have improved my confidence tremendously! Losing $230 into a river would bum me out very much, but I can do that three times, and it would still be cheaper than losing a single 5” miniquad! This makes my 3” Kestrel my “hold my beer” quad. Is there a good chance the quad is going to get wet? Am I likely to lose my quad in the woods? Is it going to get stuck on top of a building? Hold my beer, and I’ll use my Kestrel! Light weight has other advantages! 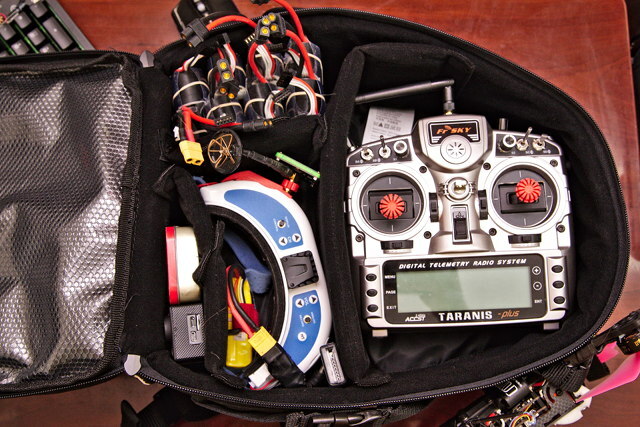 My usual backpack is a huge ThinkTank FPV Airport Helipak. Loaded up with all my gear and batteries, it is well over 25 pounds. It isn’t bad when I’m driving, but it is quite a bit to carry when I ride my e-bike to the park. I have an AmazonBasics camera bag that I sometimes use to carry my gear, but I have to pare down quite a bit. 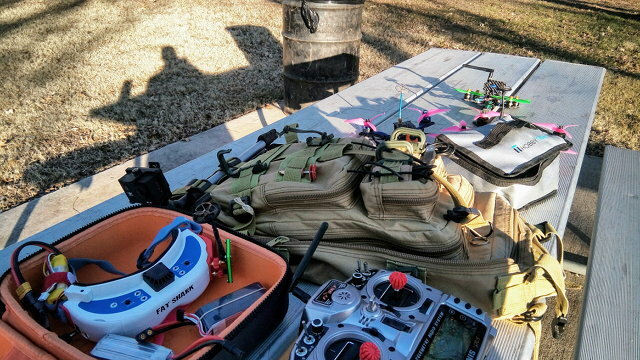 I only bring my transmitter, goggles, one quad, and as many batteries as I can squeeze in. Sometimes I strap my 2-pound Moon Lence chair on there as well. If I take my 5” quad, that means I’ll bring six batteries. With the chair, this weighs just over 12 pounds, and that’s enough batteries to keep me in the air for 18 to 24 minutes. If I take my 3” Kestrel, I carry six 650 mAh 4S and six 450 mAh 4S packs, and I have plenty of room for more. With the chair, this comes in at around 9 pounds. That’s not a huge difference, but now I’m carrying enough battery for 45 minutes of aggressive freestyle flying, and everything weighs in at about 1/3 as much as my big ThinkTank setup! I could easily fit more batteries and a spare Kestrel, and it still wouldn’t reach ten pounds. Fitting a second 5” quad would be cumbersome. If you run a Turtle or Split, you may also be degrading the quality of your FPV video feed. I use Runcam Micro Eagle cameras on all my 5” miniquads, and the Turtle is a huge downgrade. The Eagle has a wider field of view, transitions between lighting changes more quickly, and has much better dynamic range. The Runcam Micro Eagle costs $45. That’s 70% of the cost of a Caddx Turtle, but the Turtle also doubles as your HD camera. I was flying on a cloudy day with the Turtle, and it was nearly impossible to even see the trees without leaves. It is difficult to spot the branches with a Runcam Eagle, but with the Turtle, small trees manage to completely sneak up on me! FPV is full of trade-offs. This is just another one of those trade offs that you need to be aware of. I hope the Turtle and Split continue to improve! I doubt this is the end of the road for the Turtle and Split. They’re outclassed by a $100 GoPro Session from 2014, and that GoPro Session is already quite far behind the current $380 GoPro HERO7 Black. I am confident that Runcam and Caddx will continue to improve these cameras. I’ll be surprised if a Turtle or Split doesn’t manage to surpass the performance of the old GoPro Session in a couple years. I’m sure GoPro will continue to improve their cameras, so I would be very surprised if Caddx or Runcam could ever manage to actually catch up. They don’t need to catch up, though. They each have a camera that is a reasonable compromise. Their cameras are a fraction of the price, weigh next to nothing, and do the jobs of both your HD and FPV cameras. These cameras don’t need to perform as well as a GoPro. They just need to perform well enough, and they almost do that today. Was the Caddx Turtle the right choice? I have a short list of reasons for both why I’m pleased and disappointed with the Caddx Turtle. I expect there’s a good chance that I’ll change my mind about some of my complaints, so I’m going to hold off on talking about the pros and cons of the Turtle for now. It is absolutely fine for what it is: a $65 camera that manages to handle the responsibilities of my $45 Runcam Eagle and my $200 GoPro. It does neither job as well, but it is a great value and compromise at this price point. Just a year ago, I couldn’t have been more displeased with Splits or Turtles on micro quads. The footage was usually shaky, the quads didn’t fly all that well, and fitting all that gear into a single 20x20 stack was just too much work! These cameras have made some incremental improvements in their recording capabilities, the 20x20 hardware has improved enough that it almost matches our 30x30 hardware, and Betaflight has micro quads flying better than ever. There’s also no shortage from frames with room for two or three 20x20 stacks—including my own 3” Kestrel frame! 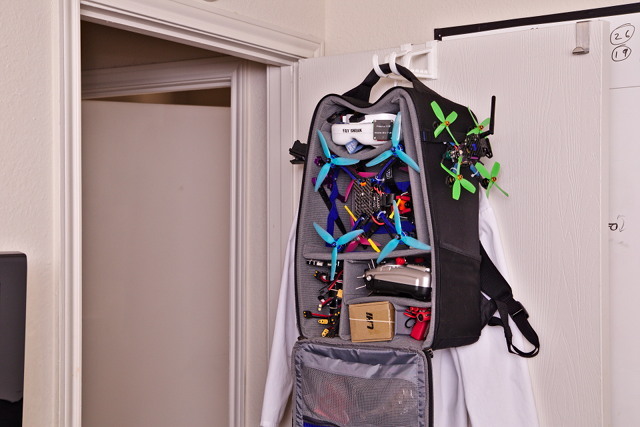 There’s not much excuse left for not carrying a 3” HD micro quad in your FPV backpack. Are you flying with a Turtle or Split? Is it on a micro or a miniquad? What do you think of it? Let me know in the comments below, or stop by our Discord server to chat about it! Over the summer, I was diagnosed with Chronic Kidney Disease (CKD). I could dedicate a series of long blog posts to this topic, but only a small part of my troubles are relevant to this particular blog post. At the time, I may have been just a few weeks or months away from needing dialysis. One of the oddities in my blood tests was a high calcium reading. I don’t want you to worry. I’ve made changes to my diet, I spent a lot of time sleeping, and my kidneys have adequately resumed their duties, but the high calcium level is still there—though it isn’t all that far outside the normal range now! When my kidney specialist told me to avoid calcium, I didn’t think that would be a problem. I was surprised how difficult it was! At that time, I was sleeping sixteen hours each day, and when I was awake, I was always tired. I’d find myself wandering around the house while my wife was asleep or at work, and I’d be wondering what I should eat. I didn’t have much of an appetite, but I was often foraging through the cabinets looking for something small and easy to prepare. My choices were limited. When my doctor confirmed that I was diabetic, the diet was quite simple; avoid carbs and eat protein! He called me the next morning, because the results of my blood test were in, and my kidneys were barely functioning. The kidney specialist threw a wrench into the works. Since my kidneys were failing, I also needed to avoid protein. Avoid carbs. Avoid protein. Avoid calcium. I was excited one day when I found a can of corn in the cupboard. Butter doesn’t have much calcium, and the carbs aren’t too terrible, and I can microwave corn! Then I read the nutrition information. That little can of corn had more calcium than a glass of milk or a slice of pizza! I had to give up pizza, and I had to give up my daily lattes. That stupid can of corn wasn’t going to be on my list of high-calcium foods to cheat with! I still remember the day I put the moth balls in my Rancilio Silvia. I was too tired to put the espresso machine away on the day we got home from the news that I can’t have any calcium. A few days later, though, I emptied the reservoir and drained as much water as I could out of the boiler. It was just another thing I couldn’t have or do anymore. I’d been using that machine every day for nearly four years. Draining Miss Silvia and putting my Craft Coffee subscription on hold was a bummer of epic proportions! When I started feeling better, I wanted coffee! When I was asleep more than I was awake, I didn’t really miss drinking lattes. As my condition started to improve, I really wanted to add coffee back to my diet. I’ve been keeping my calorie intake low, and I’ve been avoiding as much sugar and calcium as I can. I started doing some research. How can I make a latte with no calcium? Avoiding fat and sugar is easy—skim milk and Stevia will do that trick there! How do you avoid calcium? The Internet gave me all sorts of ideas. Several non-dairy milks are low in calcium. The options available at the grocery store were a different story. I checked the labels on cocounut, almond, and soy milk—any milk-like substance I could get my hands on. They all had as much or more calcium than real milk! I assume they’re fortified in some way. I didn’t even look at the non-dairy creamers at first. It seemed blasphemous to use some sort of weird mixture of chemicals and vegetable oil in a latte. I don’t know why I thought this, because I would have considered using soy or almond milk just as blasphemous a year ago! Non-dairy creamer is calcium free, and it is available with or without sugar. I’m talking about the liquid stuff in the dairy refrigeration, and not that weird powdered stuff. I’m using Nestle Coffee Mate. It is available is all sorts of flavors, but I’m using the original unflavored kind. 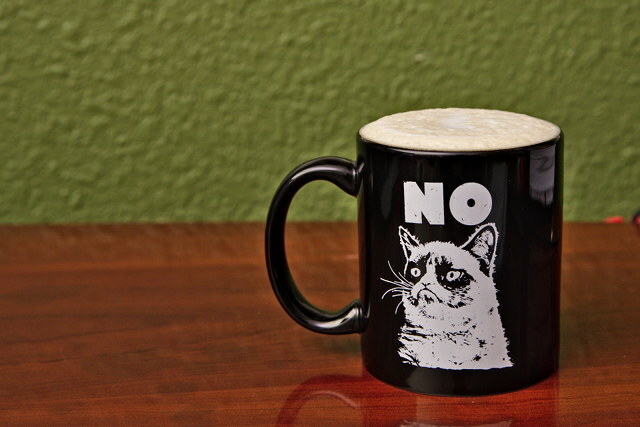 Can you make an awesome latte with non-dairy creamer?! Absolutely not. I experimented a lot, and I still haven’t made anything as good as a latte with 100% whole milk. I’ve made things that aren’t entirely unlike a latte, though, and they taste alright. Not as good as the real thing, but they’re enjoyable. Coffee Mate creamer lattes taste alright, but the texture is all wrong. They aren’t unpleasant, but the foam isn’t right, and the foam disappears long before you finish sipping your latte. Heavy cream is low in calcium! Heavy cream was my first mistake. I don’t know why, but I assumed the fats from the milk were what my latte was missing in regards to both flavor and the problems with the foam. I was wrong. The heavy cream available at the supermarket is ultra-pasteurized. That means they take it up to a higher temperature than regular milk during the pasteurization process, and this changes the sugars. That changes the flavor a lot. Ultra-pasteurized lattes taste funny. And the heavy cream didn’t help my foam. It isn’t the fats in the milk that make up the structure of the foam. You need the proteins. You would think I would have figured this out on my own. I’ve steamed skim milk before. The texture isn’t as nice as whole milk, but the foam is plenty stable. I tried various ratios of non-dairy creamer, heavy cream, and water. The water was to bulk up the contents of the steaming pitcher a bit. It also helped dilute the latte without adding additional fat or calories. I don’t add water to my pitcher anymore, but it did work well enough. The important lesson that I learned here is that milk is quite different than watered-down heavy cream! If you want proper foam, you need to add some milk! I’ve given up on making completely calcium-free lattes. My levels are down quite a bit, and they may even be in the normal range next time I get checked. I’ve been adding some milk to my steaming pitcher. It doesn’t take a lot of milk to improve the foam by a huge margin. I’ve tried ratios of around 20% milk and 80% heavy cream, and even that comes out looking and feeling so much more like a proper latte than a 100% Coffee Mate latte. The more milk you use, the better it tastes. I’ve settled in on using about 1/3 2% milk with 2/3 Coffee Mate non-dairy creamer. It isn’t perfect, but it is definitely satisfying my craving. I’m not certain how much of each ingredient I’m actually ingesting. There’s always a lot of extra liquid left in the pitcher. I imagine that most of the foam winds up coming from the milk, while the remainder of the steamed liquid is close to the expected ratio of milk and creamer. I’ve switched from my old triple-shot basket to a double-shot, so I’ve reduced the size of my overall latte by 1/3. One 8-ounce serving of milk has roughly 300 mg of calcium. I’m probably putting about 3 ounces of milk into my steaming pitcher, so that’s a total of 100 mg of calcium. I’m using about half of the volume of fluid from the pitcher in my double-shot latte. I imagine I’m getting somewhere around 50 mg of calcium per latte—certainly less than 100 mg! I am definitely leaning towards the diabetic side. It is at the very least a major contributing factor in my kidneys shutting down. I’ve been doing a good job managing my carbohydrates, and my glucose numbers are still a little above normal, so I’m avoiding using sugar in my lattes. I’ve tried Stevia and Splenda. Neither tastes right, but I’ve learned that if I use both Stevia and sugar, I barely notice the odd taste of the Stevia. Sugar in a latte?! That’s crazy talk! Quite a few years ago, I learned that I am a supertaster. I guess most supertasters learn to tolerate the strong flavors that they don’t enjoy, and it seems to be common for those supertasters to find their calling as chefs. I never learned this skill. I’ve tried tasting regular coffee and espresso right out of the machine. My photography and limited audio-editing expertise would describe the sensation as being a lot like clipping. No matter the coffee, my bitter taste buds feel like they’re maxed out. Add some milk and sugar, and I can usually pick out many of the things that Craft Coffee lists on their tasting notes on each bag of beans. I will be sticking with sweet lattes. I do cheat every once in a while. After taking such a long vacation from the Rancilio Silvia, my success ratio with pulling shots has plummeted. I’m doing better, but I’m still much more likely to get a fast pull than I used to be. When I see what seems to be a perfectly timed pull, I think about dumping out my concoction of Coffee Mate creamer, milk, and heavy cream. Will one whole-milk latte kill me? I’d say I’ve cheated roughly once a month, and I try to use 100% whole milk and all sugar at least once with each bag of coffee beans. The foam is better. The texture of the milk is better. Milk tastes better. Drinking a 100% whole-milk latte is an amazing treat for me! I was hoping that last month’s blood test would tell me that my calcium levels were fine. I already knew my kidneys were doing a fantastic job again, and there was a good chance my worries about high calcium levels were over. I wasn’t quite that lucky, but that’s OK! I’m functioning well enough that I can get away with eating a couple slices of pizza and drinking one whole-milk latte every month, but I think I’m going to be drinking these downgraded lattes for a long time. I better get used to them! I don’t think this post will have a wide audience. My Google searches for a calcium-free latte came up completely empty. I imagine there aren’t a lot of folks making lattes at home every day, and a low-calcium diet seems extremely uncommon. I doubt there’s much overlap between those two groups! I bet there are at least two of us, though! I’ve already done the research and experimentation. Now you don’t have to!